CTIP empowers survivors of human trafficking with small business training, counseling and funding. Srey, who lost the use of her leg as the result of contracting polio at age 2, was one of six children. Poverty forced her to drop out of school in the sixth grade to find work and forfeit her dream of earning an education. At 15, following her mother’s death, her father took her to live with his cousin in the capital city Phnom Penh, where she could earn the equivalent of $12.50 (USD) each month selling rice. 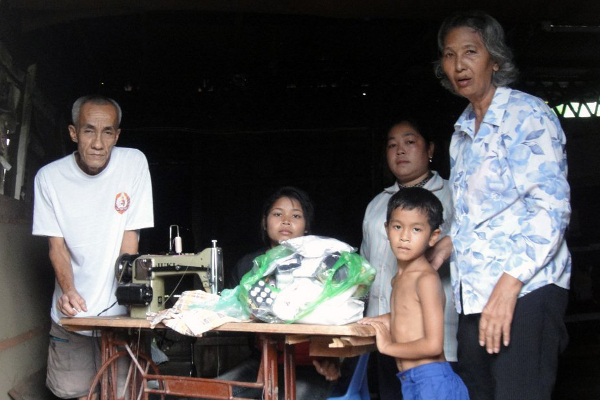 Three years later she returned home, where she attended a vocational training program and learned to sew. She tried to work as a seamstress in Poipet, a thriving city on the Thai border, but that effort failed. Living conditions among other workers was too difficult. Feeling frustrated and desperate, Srey listened to a broker describe how she could earn money and take advantage of her disability by begging on the streets in Thailand. Feeling like she had few options and no hope, she followed his suggestion, only to find life as a beggar even more miserable. Srey sought help from the Cambodia Women’s Crisis Center, a Counter Trafficking in Persons program partner, where she received food and shelter, medical attention and counseling. She received additional sewing instruction and small business training. After 10 months of preparation, she returned to her home province and used a life start-up grant and small business funding to establish a sewing enterprise. Today she has hope and stability. Her business is progressing and on weekends she enjoys playing basketball in a program for people with disabilities.